With ancient navigation routes dating back to the 19th century, missing course lights and clogged piers, sailing on Lake Victoria has been reduced to a risky game of trial-and-error. Lack of equipped weather stations also makes it difficult to predict weather patterns in order to take the precautions. Vitalis Leo, a retired captain who used to ship goods across Kenya, Uganda and Tanzania waters for 20 years, says it is by sheer luck or the long experience of a coxswain that a ship can leave one post and safely dock at its destination. “Just like roads are marked for cars, navigation lights are supposed to guide the captain on the right track. The maps or charts show routes to use from one point to another,” said Mr Leo, who is now the director of the Kisumu Maritime Centre. “But without these aids, one is left to guess the passage and it can be dangerous as accidents are likely to happen,” added the retired captain adding that it was easy to get lost in the lake’s waters. With time, he gained experience and mastered the routes. The situation is a nightmare for transporters and commuters alike with a report showing that at least 5,000 fatalities are recorded on the lake annually. The 2012 report by the Lake Victoria Basin Commission (LVBC), an agency that manages lake developments for the East African Community, said the deaths are caused by unstable boats, bad weather, overloading, lack of safety equipment and poor seamanship. The stubborn weed, hyacinth water, which has choked important waterways and landings, is the latest cause of accidents. In 1996, a Tanzanian passenger ship, MV Bukoba, capsized in Lake Victoria claiming the lives of over 700 people. And just a week ago, a boat ferrying 14 musicians from Luhanda beach to Ndenda Island in Kenya capsized, killing nine of them. The Kenya Maritime Authority rescue boat could not arrive at the scene early enough to save the young artistes due to the long distance. The matter was worsened by lack of life jackets in the ill fated boat. Now, many such tragedies could be avoided, as LVBC is set to put up 16 marine rescue and co-ordination centres, which will not only ensure maritime safety procedures are met but also improve response to distress calls. Rescue centres are stations strategically put up in the lake that are equipped with rescue equipment including speed boats, a common telephone code for co-ordination and trained personnel to ensure proper management of information and quick response. The stations will be manned by marine experts drawn from the riparian states. Mwanza in Tanzania, the scene of the most fatal marine accident to have occurred on Lake Victoria 20 years ago, will become the main centre under a $3.8 million project. Other centres will be based in Kisumu and Port Bell in Uganda. The setting up of the project is expected to commence next year. Lake Victoria Environmental Management Projects (LVEMP), an implementation arm of LVBC, has secured $252 million in financial support from the French government, the World Bank and other donors to implement a number of projects, said regional project co-ordinator Dr Raymond Mngodo. Already, a common telephone code to be used by all the riparian states to communicate to the centres has been gazetted to improve co-ordination, the new LVBC executive secretary Dr Ali Matano said. “A hotline number 110 has already been gazetted for the purpose. Whenever there is distress, just dial the number and the nearest rescue centre will be alerted,” said Dr Matano. Dr Matano says the survey and mapping of the lake has already been done. It involves drawing up new navigation routes and installation of navigation aids like buoys and floodlights to mark the course to be followed by cargo, tourist and passenger ships that are cruising from one port to another. This is being done according to the safety regulatory framework under the EAC Lake Victoria Transport Act and Regulations, which was approved by member states in 2010. The commission last month, finalised the distribution of navigational aids to major East African ports of Kisumu in Kenya, Port bell in Uganda and Mwanza in Tanzania. 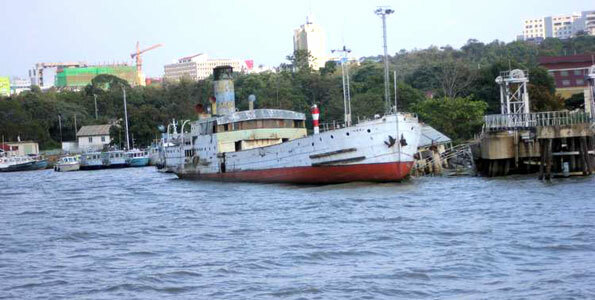 While handing over the project to the Kenyan government at the Kisumu port, LVBC deputy executive secretary for programmes and projects Eugene Muramira said the $3.8 million they received from the World Bank was meant to undertake several safety projects including updating of the maritime safety regulations, establishment of a search and rescue organisation for the lake, communications, aids to navigation and nautical charts and maps. Some $1.5 million was used to carry out survey and mapping of marine transport routes and installation of aids to navigation facilities in Kenya, Uganda and Tanzania. The Kenya Marine Contractor (KMC) embarked on the project in April 2014 to design, supply, install and commission navigation aids to the three countries. A total of 86 navigation aids were installed, with Kenya receiving 18 while Tanzania and Uganda which own a larger percentage of lake surface receiving 46 and 22 respectively. “Under the project, a total of 20 maritime officers were trained to address issues affecting the lake, including oil spillage and hazardous waste management. Two officers are Kenyan while the rest are from the riparian states,” said Mr Muramira. LVBC maritime safety officer Gerson Fumbuka said the navigation aids would guide the captains on the right track, just like roads are marked for cars. “The significance of navigation aids is that they help the ship captains to determine where they are and to enable them to cross each other without colliding even in the rain. When a vessel is sailing from Homa Bay to Kisumu in Kenya, for instance, the captain will bypass special alerts and estimate the distance to the shore. If it is the fourth beam, they know they are close to Nyapondi,” said Mr Fumbuka. Ships are also supposed to have red and green lights to avoid collision. The right side starboard of ship is red while the left port is green. He said fishermen know the rules. Mr Fumbuka said there was also a mast with a sector light at the major piers that is visible to ship captains about eight nautical miles away to notify them that they are about to dock. “All the lights go on automatically at 6pm and go off 12 hours later,” he said. Mr Fumbuka said the masts will in the next six months double up as a digital weather forecast station, collecting data through a Sim card and remitting it to meteorological departments across the riparian states. This will enable sailors travel only when the weather is favourable, thus avoiding accidents. Kenyan Environment Principal Secretary Charles Sunkuli, while commissioning the project, said ferry services have been unable to operate on a commercial basis on the lake. He blamed this on challenges such as outdated infrastructure, meagre funding for their development and inadequate management. “Sustainable development is about protecting valuable resources and at the same time facilitating socio-economic development that will benefit future generations,” said Mr Sunkuli. In Mwanza, the navigational aids were presented to the Principal Secretary of the Ministry of Natural Resources, (Rtd) Major General Gaudence Milanzi, on behalf of the Tanzanian government. Mr Milanzi urged residents on the shores of Lake Victoria to refrain from the temptation to vandalise the newly installed navigational aid at Mwanza Port for the safety of hundreds of passengers sailing on Lake. The sentiments were echoed by Mr Sunkuli who asked the Ministry of Transport to work out modalities to keep the project secured in collaboration with the riparian county governments of Busia, Siaya, Kisumu, Homa Bay and Migori.